Pictures below give a progression of the renovations throughout the years. The present church was built in 1987 to replace the original church that was destroyed by fire. 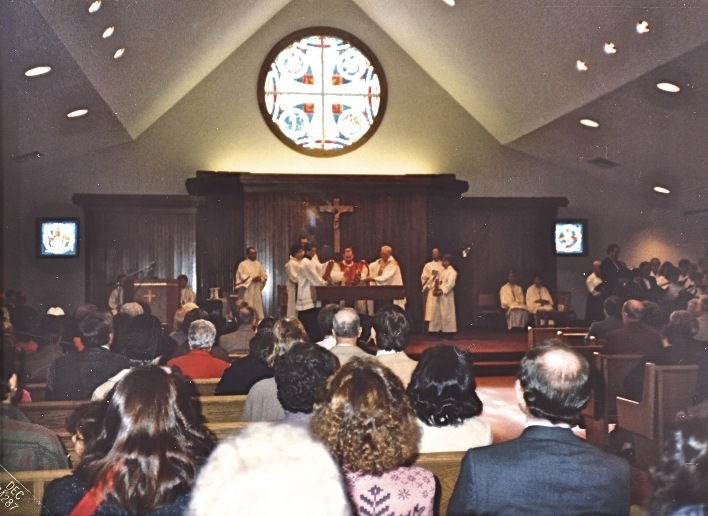 The first picture shows Bishop Gelineau consecrating the new church in 1987 December. The only religious image is the crucifix hanging over the celebrants seat. Clergy, Extraordinary Ministers, Readers and Altar Servers seated facing the congregation on the back wall of the sanctuary, devoid of Catholic identity. The choir, off to the right is a focal point of the church. This picture shows the church as it was when I arrived in 2002 July. The previous pastor removed the Blessed Sacrament from a cupboard hidden in the wall of the sanctuary, placing it in the center of the sanctuary and added some religious images. 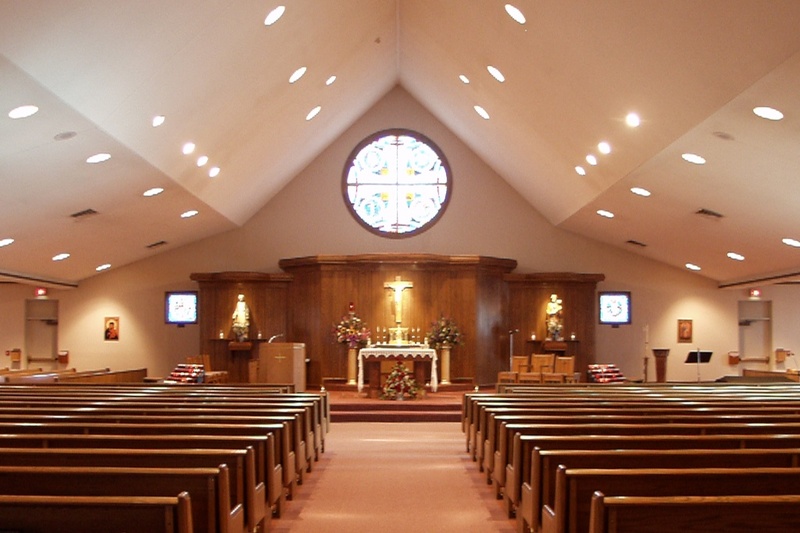 Note: The choir was located to the right of the sanctuary. In the picture, you can see a music stand and the top of the Korg Keyboard. The baptismal font was pushed against the wall to give room to the choir. During Mass, it was as if the priest were part of the choir. 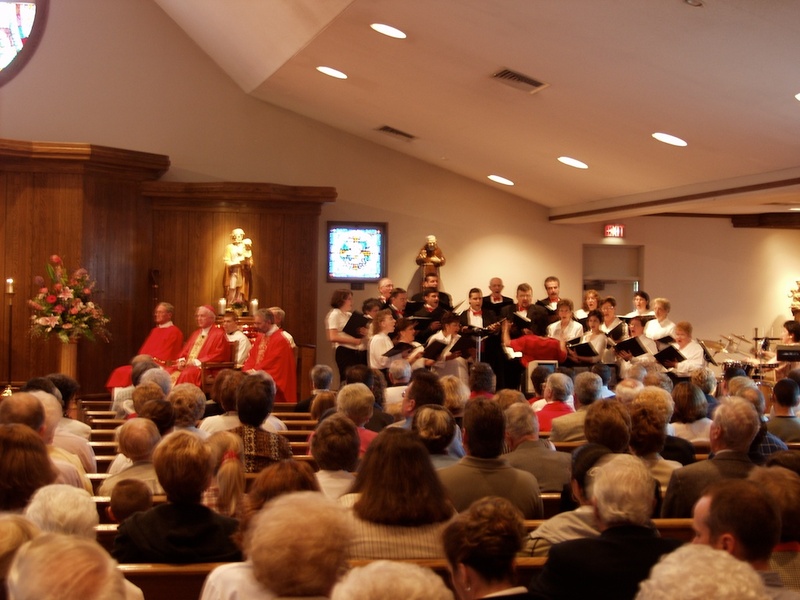 Two pictures of the 90th Anniversary celebration in 2003 give a closer view of the sanctuary and the placement of the choir. One of the first renovations to the church was adding a traditional confessional. Looking past the confessional, you can see the old cry room. Eventually, it was converted to the choir area, and the cry room was moved to the front. All of the woodwork for the renovation was done by a parishioner who owned a professional woodworking company. Painting, gilding, tile work and all of the nitty gritty was done by volunteers. 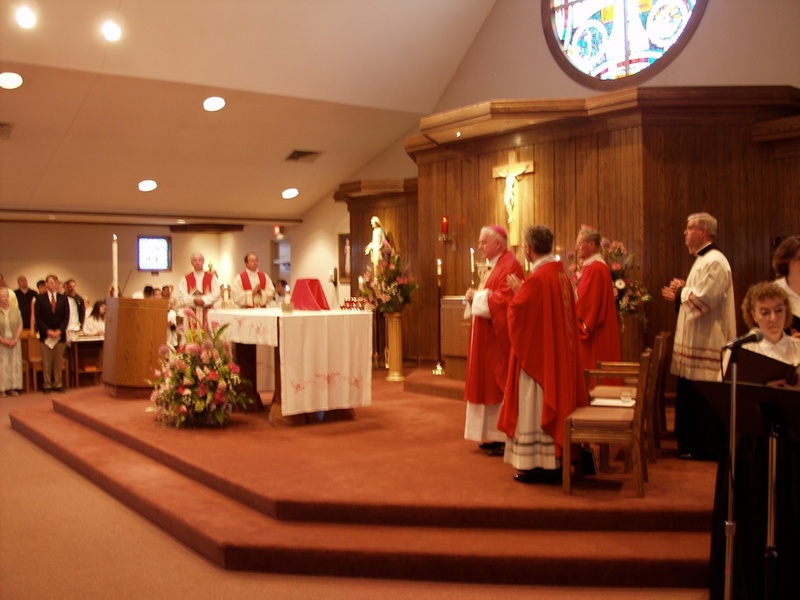 When is the Latin mass celebrated,English traditional mass church looks very nice in pic love lamp, alter rail?? ?